Effec­tive Altru­ism Com­mu­nity Build­ing Grants is a pro­ject run by the Cen­tre for Effec­tive Altru­ism (CEA), pro­vid­ing grants of be­tween $5,000 and $100,000 to in­di­vi­d­u­als and groups do­ing lo­cal effec­tive al­tru­ism com­mu­nity build­ing for the aca­demic year of 2018-19. We be­lieve this could be a high im­pact pro­ject for the EA com­mu­nity in the long term, be­cause it is a way in which we can in­crease the time and effort that goes into EA com­mu­nity build­ing. This post is an up­date on how the pro­ject is go­ing so far, in­clud­ing an overview of the ap­pli­ca­tion pro­cess, the grants we’ve made, our eval­u­a­tion crite­ria, and plans for the fu­ture. Effec­tive al­tru­ism groups are an in­te­gral part of the EA com­mu­nity and have played a cen­tral role in helping the com­mu­nity achieve many of its aims. They help di­rect funds to effec­tive causes, in­fluence peo­ple’s ca­reer tra­jec­to­ries (in­clud­ing plac­ing peo­ple in high-im­pact or­gani­sa­tions), con­tribute to the in­tel­lec­tual progress of the com­mu­nity, and help shape EA cul­ture. The goal of Com­mu­nity Build­ing Grants is to scale the im­pact of high-po­ten­tial effec­tive al­tru­ism groups by in­creas­ing their or­gani­sa­tional ca­pac­ity. We ex­pect this to have a num­ber of benefi­cial effects, but we see a key benefit be­ing the em­pow­er­ment of group mem­bers to work on the world’s most im­por­tant prob­lems. We also ex­pect Com­mu­nity Build­ing Grants to en­able group or­ganisers to bet­ter co­or­di­nate and sup­port each other, to pur­sue valuable pro­jects out­side the scope of EA com­mu­nity build­ing, and to more more effec­tively dis­sem­i­nate a high fidelity un­der­stand­ing of effec­tive al­tru­ism. This is a new pro­ject for CEA and can be seen as a way of test­ing the hy­poth­e­sised route to im­pact of pro­vid­ing sig­nifi­cant fund­ing to effec­tive al­tru­ism groups. If we judge EA Com­mu­nity Grants to have been suc­cess­ful, we in­tend to ex­pand the pro­ject and the amount of fund­ing al­lo­cated to it. Be­cause the pro­ject is new, we’re also in the pro­cess of re­solv­ing any kinks and ex­pect to con­tinue to tweak the pro­cess as we learn more about how to ex­e­cute it effec­tively. To read more about EA Com­mu­nity Build­ing Grants and the core ra­tio­nale for the pro­ject, see this launch post. The EA Com­mu­nity Grants were ad­ver­tised via the EA Fo­rum in March, in the grants an­nounce­ment post, with a link to the ap­pli­ca­tion form. Ap­pli­cants could ap­ply as in­di­vi­d­u­als or with a joint ap­pli­ca­tion. Ap­pli­cants who passed the first in­ter­view stage were then in­ter­viewed by Harri Besceli, with Kerry Vaughan mon­i­tor­ing the in­ter­view pro­cess dur­ing April and May. After the in­ter­views, fi­nal de­ci­sions were made by June. Ap­pli­cants also nom­i­nated refer­ees who were asked to provide a refer­ence in bor­der­line cases. Ap­pli­cants were scored on three crite­ria, and the scores were com­bined (us­ing equal weight­ing) to cre­ate an over­all rat­ing of the ap­pli­ca­tion. This acted as a key in­put to the fi­nal de­ci­sions but did not solely de­ter­mine the fi­nal de­ci­sions. Since launch­ing in March, 22 grant offers were made, for a to­tal of $623,000, with the sig­nifi­cant ma­jor­ity of grants offers be­ing to en­able group or­ganisers to work full- or part-time on or­ganis­ing their effec­tive al­tru­ism group. Of the 22 offers made, 18 are to fund in­di­vi­d­u­als di­rectly work­ing on their effec­tive al­tru­ism group, and 4 were for gen­eral ex­penses for groups or spe­cific pro­jects. The table be­low lists the grants made, the num­ber of peo­ple who will be work­ing part- or full-time as a re­sult of the grants, and the length of the grant pe­riod. The ma­jor­ity of the grant pe­ri­ods started at the be­gin­ning of this month. A small num­ber of ap­pli­ca­tions to EA Com­mu­nity Grants were referred to EA Grants for eval­u­a­tion, and aren’t in­cluded be­low. We ul­ti­mately granted sig­nifi­cantly more fund­ing than we ex­pected to. This was largely due to the qual­ity of ap­pli­cants ex­ceed­ing our ex­pec­ta­tions, but also be­cause we con­cluded that the po­ten­tial for harm­ful in­di­rect effects was smaller than we pre­vi­ously thought. Re­cip­i­ents of EA com­mu­nity grants will largely work in­de­pen­dently from and au­tonomously to CEA. The main sup­port offered is reg­u­lar calls with CEA staff, a pri­vate Slack chan­nel, and a re­treat which took place in Septem­ber (hosted and co-or­ganised by the Czech As­so­ci­a­tion for Effec­tive Altru­ism). The struc­ture and ex­tent of sup­port for grantees is some­thing that we in­tend to ex­per­i­ment with sig­nifi­cantly over the du­ra­tion of the grant pe­riod. Give groups clear guidance on what would cause us to eval­u­ate their ac­tivi­ties favourably. Make it easy for the EA com­mu­nity and po­ten­tial fun­ders to un­der­stand and eval­u­ate the suc­cess of EA Com­mu­nity Grants. Provide suffi­cient ev­i­dence of the value pro­duced to en­able CEA to make well-in­formed de­ci­sions on whether to re­new fund­ing for given groups, and whether to scale the EA Com­mu­nity Grants pro­cess. Avoid in­cen­tivis­ing groups to op­ti­mise for our met­rics rather than for what is ac­tu­ally high­est-im­pact. Min­imise the time cost to CEA and to groups in eval­u­at­ing their re­sults. On the ba­sis of these crite­ria, we’ve cho­sen to eval­u­ate the suc­cess of grants pri­mar­ily by as­sess­ing out­comes per­tain­ing to in­fluenc­ing the ca­reer tra­jec­to­ries of their mem­bers, but also by tak­ing into ac­count how groups are good rep­re­sen­ta­tives of the EA com­mu­nity and by eval­u­at­ing other valuable out­comes on a case-by-case ba­sis. The pri­mary met­ric used to as­sess grants at the end of the first year is the num­ber of group mem­bers who ap­ply for in­tern­ships or grad­u­ate pro­grams in pri­or­ity ar­eas and reach at least the in­ter­view stage. For sub­se­quent years, the pri­mary met­ric used to as­sess the grants is the num­ber of group mem­bers who go on to work in pri­or­ity ar­eas. We have cho­sen to pri­ori­tise ca­reer-re­lated out­comes be­cause we be­lieve that this will track a key source of value of the com­mu­nity grants and be­cause we feel like we have a rea­son­able un­der­stand­ing of the value of these kinds of out­comes. Though ca­reer-re­lated out­comes will be a use­ful proxy for suc­cess, it’s worth em­pha­sis­ing that we don’t ex­pect them to cap­ture all of the value that the groups pro­duce. How­ever, we feel it is im­por­tant to have some con­crete met­rics for our pro­jects, es­pe­cially ones that re­quire a lot of peo­ple’s time and money. We used the 80,000 Hours list of pri­or­ity paths as the ba­sis for our list of ac­cred­ited roles, but ex­panded it to be some­what broader. The ar­eas and roles that we in­tend to ac­credit are still be­ing de­cided upon, and we ex­pect the num­ber of ac­cred­ited roles and ar­eas to in­crease in the fu­ture. We’ve cho­sen a rel­a­tively re­stricted set of crite­ria for the time be­ing, as we think the costs to later re­strict­ing the crite­ria will be sig­nifi­cantly higher than the costs of ex­pand­ing them. A gen­eral ex­pec­ta­tion of all grantees and a nec­es­sary con­di­tion for re­ceiv­ing fur­ther fund­ing is that they abide by CEA’s Guid­ing Prin­ci­ples of Effec­tive Altru­ism, and are good rep­re­sen­ta­tives of the EA com­mu­nity. By this, we mean that we ex­pect the in­di­rect effects of grantees to the com­mu­nity to be pos­i­tive, both by af­fect­ing the pub­lic per­cep­tion of effec­tive al­tru­ism, and the cul­tural norms of the effec­tive al­tru­ism com­mu­nity. Beyond ca­reer-re­lated out­comes, we will en­courage grantees to sub­mit other out­comes that they’ve pro­duced, which we can eval­u­ate on a case-by-case ba­sis. Such out­comes could in­clude ca­reer-re­lated out­comes not pre­vi­ously speci­fied, or non-ca­reer re­lated out­comes, such as sup­port­ing other EA Groups, in­fluenc­ing dona­tions, etc. This is in part in­tended to min­imise the po­ten­tial of cre­at­ing ad­verse in­cen­tives, and to help us bet­ter un­der­stand the value cre­ated by grantees for fu­ture eval­u­a­tion rounds. Helping out other EA groups, with in­for­ma­tion and shared best prac­tices. Dis­tort­ing think­ing of the grantees by giv­ing them in­cen­tive to be­lieve this is just the cor­rect thing to do and not ques­tion it too closely. We hope to avoid these nega­tive effects by pro­vid­ing af­ter-the-fact as­sign­ment of credit for out­comes out­side the scope of the pri­mary suc­cess crite­ria, and by em­pha­sis­ing the crite­rion of ‘be­ing a good rep­re­sen­ta­tive of EA’. We recog­nise that these mea­sures may be im­perfect, and may seek to make im­prove­ments to fu­ture eval­u­a­tion crite­ria based on our mid-term re­view of cur­rent grantees’ re­ported out­comes. CEA will run an­other, smaller, EA Com­mu­nity Grants round in Jan­uary 2019, and in the sum­mer of 2019, when the suc­cess of the first com­mu­nity grants will also be eval­u­ated. Prior to the sum­mer 2019 fund­ing round, we’ll eval­u­ate the grants pro­vided so far. If we judge spe­cific EA Com­mu­nity Grants to be suc­cess­ful, we’ll re­new the fund­ing pro­vided to those groups in the fund­ing round, and for groups we judge to have been par­tic­u­larly suc­cess­ful, we’ll provide grants for time pe­ri­ods longer than a year. Ad­di­tion­ally, if we judge the pro­cess as a whole to have been suc­cess­ful, we’ll ex­pand the num­ber of groups we fund. 5 peo­ple work­ing on sup­port­ing and co­or­di­nat­ing EA Com­mu­nity Gran­tees, pro­vid­ing a com­bi­na­tion of re­treats, con­fer­ences, train­ing, men­tor­ship, on­line in­fras­truc­ture etc. If you’d like to sup­port EA Com­mu­nity Build­ing Grants, you can do so here. Ad­di­tional fund­ing would likely in­crease our will­ing­ness to fund more groups in the Jan­uary fund­ing round, al­though this de­pends on the ap­pli­cant pool. 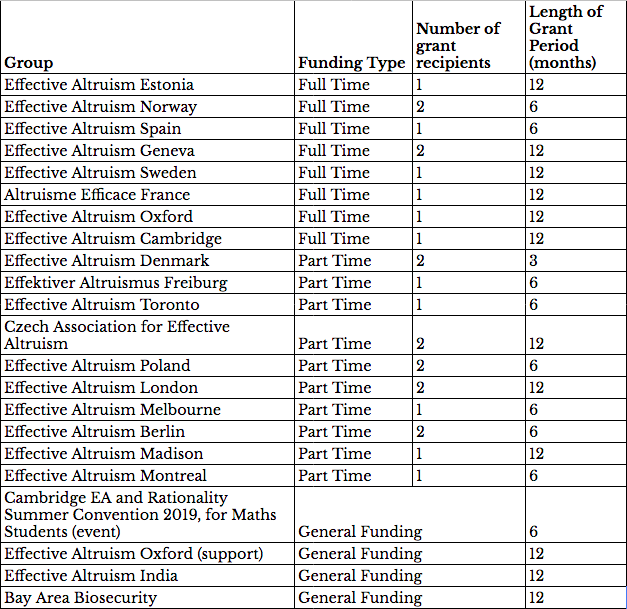 If you have any ques­tions re­lat­ing to EA Com­mu­nity Grants, please con­tact groups@effec­tivealtru­ism.org. The 80k’s pri­or­ity paths are ba­si­cally X-risk, work at an EA org (does ‘cause pri­ori­ti­sa­tion’ hap­pen any­where else?) and earn to give. As such, on your stated pri­mary met­ric, it seems any­one who switched their ca­reer from do­ing noth­ing to work­ing on any of an­i­mals, global poverty, men­tal health or cli­mate change would not count as a valuable shift. In other words, CEA only counts a ca­reer change as worth­while if it fo­cuses on the far fu­ture. Three points on this. First, if this is the case—and please tell me if I’m mis­taken—I con­sider it to be deeply re­gret­table. It moves the EA com­mu­nity from be­ing a morally in­clu­sive one (I’ve writ­ten on this pre­vi­ously), which brings to­gether in­di­vi­d­u­als who do—ac­cord­ing to their own lights—the most good they can, and seek to help each other, to a morally ex­clu­sive one, where there is a right an­swer, we need to fight over what it is, and CEA will fi­nan­cially re­ward you if you ac­cept their an­swer. It seems the sort of thing that would lead to the split of the EA move­ment (i.e “if EA is just effec­tive fu­tur­ism, those of us who aren’t effec­tive fu­tur­ists should go and do our own thing”). I sub­mit that your eval­u­a­tion crite­ria—us­ing 80k’s list—fails your own rep­re­sen­ta­tive­ness test, be­cause it judges im­pact by a stan­dard that would not be widely ac­cepted among self-iden­ti­fy­ing effec­tive al­tru­ists. Third, given the eval­u­a­tion crite­ria is quite sharply di­ver­gent from what peo­ple would ex­pect, I would have ap­pre­ci­ated if this had been flagged more clearly. I think some ad­di­tional color on how we ex­panded the crite­ria to be broader than 80K pri­or­ity paths and how we ex­pect to ex­pand it to be broader in the fu­ture will miti­gate some (but not all) of your con­cerns. 80K pri­or­ity paths are the ini­tial ba­sis of our list of ac­cred­ited roles be­cause we have high cre­dence that these are high-im­pact roles and be­cause 80K can provide in­fras­truc­ture to as­sist in helping mem­bers of lo­cal groups con­nect with some of these roles. We don’t ex­pect that these are the only roles that are im­por­tant and it is not our in­tent to ac­credit only these roles. Our cur­rent best guess for how to pro­ceed is to ac­credit any­one work­ing at an or­ga­ni­za­tion on the 80K Job Board (which in­cludes global poverty and an­i­mal welfare or­ga­ni­za­tion) but con­tinue to re­view in­di­vi­d­ual pos­i­tive out­comes on a case-by-case ba­sis and ac­credit some ca­reer-re­lated out­comes that are nei­ther on the 80K job board nor Open Phil/​GiveWell grantees. Our cur­rent best guess for how to do this is to use the cause pri­ori­ti­za­tion re­search done by oth­ers to cre­ate an ini­tial list of clear, easy-to-un­der­stand pos­i­tive out­comes that we can com­mu­ni­cate to CEA’s donors and grantees and then to ac­credit ad­di­tional pos­i­tive out­comes on a case-by-case ba­sis. We think this is su­pe­rior to ac­cred­it­ing ev­ery­thing on a case-by-case ba­sis be­cause it re­duces un­cer­tainty for grantees and makes the pro­ject eas­ier for fun­ders to eval­u­ate. We also think that 80K rep­re­sents the best re­search on what ca­reers have an im­pact, so it would be sur­pris­ing if we don’t take ad­van­tage of that re­source. If you think we should ac­credit en­tirely differ­ent out­comes, think this is the wrong ap­proach for ac­cred­it­ing ca­reer-re­lated out­comes, or think that we should use a differ­ent list, we’d be very open to sug­ges­tions. We plan to make the next iter­a­tions to our ac­cred­ited crite­ria be­fore the next ap­pli­ca­tion round in Jan­uary so feed­back now would be par­tic­u­larly timely. Thanks for pro­vid­ing this writeup! This seems to as­sume most group mem­bers will be quite young. Is this ex­pected? De­sired? Depend­ing on how much this is em­pha­sized, it could be a turn-off to older mem­bers with es­tab­lished ca­reers they’re un­likely to change. Out of cu­ri­os­ity, was this met­ric se­lected by CEA, the groups, LEAN, or some com­bi­na­tion? Hi John, thanks for your com­ment (and sorry for the de­lay get­ting back to you)! Th­ese met­rics were se­lected by CEA, but we gave cur­rent re­cip­i­ents the op­por­tu­nity to provide feed­back on the pro­posed eval­u­a­tion pro­ce­dure. We think that one of the main route to value of EA Groups is to cause peo­ple to change their ca­reer tra­jec­tory such that they end up con­tribut­ing to solv­ing some of the world’s most im­por­tant prob­lems. It does seem that peo­ple who are will­ing to make such changes are more likely to be younger, how­ever there are a num­ber of se­nior man­age­ment po­si­tions (e.g. Chief of Staff, Chief Oper­at­ing Officer etc) available within or­gani­sa­tions that we would ac­credit that one could imag­ine would be more suit­able for peo­ple more ad­vanced in their ca­reers. As men­tioned in the post, we don’t think ca­reer changes are the only route to value for EA Groups, and that there are likely ways in which peo­ple who are un­likely to change ca­reers can con­tribute. Though given that we think ca­reer change is a ma­jor route to value, we’ve cho­sen to as­sess this speci­fi­cally. We also hope to find out the ex­tent of the value of con­tri­bu­tions from in­di­vi­d­u­als who don’t change their ca­reer by us­ing a case-by-case, af­ter-the-fact as­sess­ment. FYI, I had ap­plied to do this in Berkeley, but was pre­vi­ously turned down due to lack of data/​met­rics. I re-ap­plied in the fall, and have now re­ceived a grant to help fund rent­ing the space for REACH. I plan to do more ac­tive out­reach now that I have a more sta­ble source of fund­ing. How much was the grant and from which or­gani­sa­tion? In Oc­to­ber 2018, BERI (Berkeley Ex­is­ten­tial Risk Ini­ti­a­tive) awarded a grant of $24k to­ward REACH op­er­a­tions for 2018-2019. So far, $10k of that has been dis­persed as salary for the REACH Man­ager, Sarah “Star­dust” Spikes (me). In Novem­ber 2018, the EA Meta Fund awarded a $5k grant to for work on the REACH Panel. In De­cem­ber 2018, CEA (Cen­tre for Effec­tive Altru­ism) awarded a $14k com­mu­nity build­ing grant to­ward rent for REACH, which has been dis­persed in full to the REACH Bank ac­count. Thanks for all that you’re do­ing to make REACH hap­pen! CEA doesn’t run any reg­u­lar events, com­mu­nity spaces, or fund peo­ple to do ac­tive com­mu­nity build­ing in the Bay that I know of, which seemed odd given the den­sity of EAs in the area and thus the marginal benefit of in­creased co­or­di­na­tion there. See my re­ply to case­bash: my com­ment was not about whether it would be in gen­eral good to have a good com­mu­nity builder work­ing on stuff not cov­ered by ex­ist­ing orgs, but on whether it is “re­ally quite weird” that there isn’t any­one work­ing on it payed by this par­tic­u­lar pro­gram. “Also many of the things com­mu­nity builders are do­ing in other places make much less sense in Berkeley”—Could you clar­ify? For ex­am­ple, in some places, com­mu­nity builders may or­ga­nize events like MIRIx or AI safety read­ing group. In Bay, peo­ple can just get in touch with MIRI or CHAI. Some lo­cal or­ga­ni­za­tions or­ga­nize EAGx con­fer­ences, but there is EAG in SF or­ga­nized by CEA. In some places, com­mu­nity or­ga­niz­ers or­ga­nize shared hous­ing, but there is a lot of ra­tio­nal­ity houses already. Etc. In other words, for efforts which in some places take some frac­tion of time of one com­mu­nity builder, there is of­ten a whole ded­i­cated or­ga­ni­za­tion in the Bay Area. Enough pos­si­bil­ity space still ex­ists that it seems worth at least ex­per­i­ment­ing to see if a pro­fes­sional or­ganiser could value add, even if it were only by bet­ter ad­ver­tis­ing and pro­mot­ing the op­por­tu­ni­ties that already ex­ist. Espe­cially now that CEA is in­creas­ing its fo­cus on one-on-one mee­tups. My model for it is the whole space of op­por­tu­ni­ties in the Bay Area is large, on the other hand, many parts are already ex­ploited by ex­ist­ing or­ga­ni­za­tions. Whether the re­main­ing part war­rants some­one should be work­ing on it full-time, sup­ported par­tic­u­larly by com­mu­nity build­ing grant, is un­clear to me, but quite likely yes.